I know that I’ve used this book before and will continue to use it again. It depicts so many of the things that kids will see in our Music & Movement programs, it’s a great primer for them before we start. I also think it’s important to reinforce that kids may not join in right away and that’s okay too! I kicked today off with a cover of a Beatles song, by Caspar Babypants: Hello, Goodbye. Some of the best reactions came not from caregivers (who did really appreciate it! ), but from co-workers who heard it passing by the door or through the vent system. They had a great time with it! Move Like an Animal was fun and initiated a great game of pretend with all of the kiddos. And another version of If You’re Happy and You Know It drew in the caregivers around the room. We kept that interaction going by jumping on the El Train and traveling around the room. For our scarves, we practiced tossing them into the air when Caspar Babypants said “POP” during Pop Goes the Weasel and then they became superhero capes with Dance Floor Super Hero. A fabulous program with lots of fun had by all. This is the book that basically inspired the whole interactive book portion before the group begins to dance along to the music. Body identification, movement, animals, Carle’s illustrations, large trim-size…what more could you ask for? My first four songs set an energetic mood for the rest of the program. Wake Up, Shake Up has a great beat to it and I asked the kiddos to shake up their bodies as we started our dancing. This led to lots of interesting hair as they all shook their heads at some point. I followed this up with another free dance, Dance Like There’s Music In Your Pants, and I actually think that was poor planning on my part. They needed some instruction before free dance again. Luckily, both Spin Again and Rocketship Run have excellent instructions in the lyrics and we were able to follow along for the next two songs. Definitely a bumble this edition, but that’s 100% on me. See? You can still make mistakes even after a ton of storytimes! This rhyming picture book is one that I used a while ago and was so happy to bring back to the Shake, Shimmy programming. I love the urban setting, the diversity of the characters, and the great opportunities for interaction with the kids. I just recently added this to our books-you-can’t-miss-section and all of those copies are checked out! I spend a lot of time thinking about the best opening songs and ways to capture my group’s attention from the get-go and Get Your Move On is a great suggestion to do so. I love the countdown aspect and the free dance. That lets the littles (who are almost always raring to go) immediately show off their best dance moves. Subway was a fun way to introduce a new vocabulary words and let us form a train around the room, ensuring that ALL the grown-ups were up and moving. I highly recommend doing such an activity if you need to get the grown-ups to buy-in. Friends Give Friends a Hand was a great way to promote social-emotional development at this month’s event. I also love to talk about consent here — some friends love to give high fives, but some friends prefer waving so ask before you say hello! And then I get to model it around the room. SO GOOD. Jim Gill’s newest CD has some great material on it, but my favorite might be The Countdown. I love practice waiting in an easy, friendly environment. And reminding caregivers that they can use these kinds of songs to practice while out and about in the world too. Our wrist ribbons today became two different kinds of imaginative play: paintbrushes and butterfly wings. I like to see the different kinds of movement the kids use and how it changes from one song to another. I love a song that grown-ups can join me during, which is the beginning of this book for sure. But I *also* love a song book that takes an original tune further by adding more verses and activities to engage the kids. And that is the magic of Jane Cabrera. I love this about so many of her books! 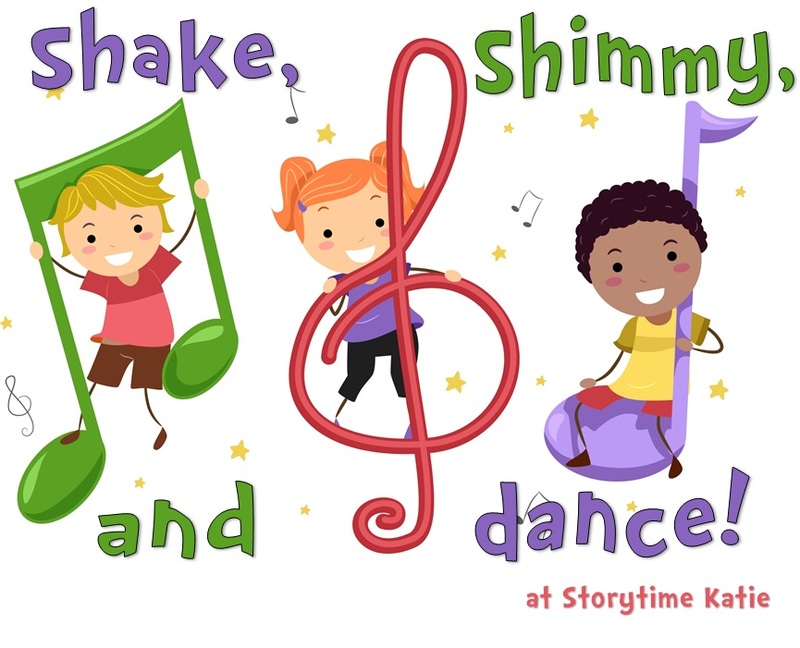 This week’s Shake, Shimmy, & Dance started with Movin’ Groovin’ by Mr. Jon & Friends. Mr. Jon is one of my favorite musicians for Shake, Shimmy, & Dance and I hope that there are more albums to come soon! This one reinforces a lot of what we do in our opening song (clap, stomp) and we all know that kids learn best through repetition. A song that’s sure to make you dizzy is Spin Around. Before starting this song, I like to let everyone that we can spin with our hands (rolling our arms) or that it’s okay to take a break from the music. Next, it was time to practice some large movement with Bouncing, Hopping, & Jumping. Then, our last song for the day before props was a free dance with Rainy Day Dance Party. Our big parachute today became a popcorn popper with Popcorn Calling Me and some crumbled up recycled paper as our popcorn pieces on top. Some kids LOVE to run underneath the parachute and “pop” the popcorn, while others are content to shake the parachute as our popcorn poppers. I try to encourage both ways, as they’re great ways to play along. Great Big Sun lets our parachute turn into a giant sun that rises up and down while kiddos get to run underneath. It’s a really joyous time for everyone involved. This is will forever be one of my favorite books for Shake, Shimmy, & Dance. I love modeling that this book can be sung to, that this book has a strong rhyme prediction sequence for kiddos, and that we’re practicing body identification while reading it together. It’s also one that works well in our large-group setting! A quartet of some of my favorite songs kicked off the start of this edition of Shake, Shimmy, & Dance. I used Take the Sun as a stretching song (though I’ve also used it as a parachute song as well). It worked well to get everyone ready to make large group movements. I also provided a modification for grown-ups to use their babies as the “sun” and lift them up and down. Jump, Jump got us up and moving, practicing our gross motor skills with large movements like spin and shake. That brought us to Silly Dance Contest. This song lets us practice our patient waiting skills as we freeze when the lyrics tell us to. It also some really fun opportunities for me to freeze in a very silly position as I know when the freezes are coming. And finally, a rock/funk version of If You’re Happy and You Know It to round out the non-prop portion of the program. Then, it was time to break out the shaker eggs! Two songs today: Super Shaker Song which has some great instructions built into the music. I will say that this song was a bit long for the end of the program. (I tend to aim for 2 or 2.5 minute songs once the props come out.) Fruit Salad Salsa is a favorite of the group and we practice shaking fast and slow depending on how the music sounds. All in all, another fantastic high-energy program! I used a book published in 2017 that I’m not 100% sure about Caldecott eligibility on so I’m going to refrain from posting about it just in case. I tried to use Moving in a Circle as we walked around the room holding the parachute. This would have varying degrees of success depending on the age of the kids, but my group did very well with it. I think with more practice, we might be able to stop, turn, and change directions someday. In and Out (Take a Trip) was intended to have kids walk towards the center of the parachute and then go back out. The parachute would have been flexible enough to follow them and I had hoped it would create a cool billowing effect. The kids, however, had other plans and went under the parachute and some went back out (but that was only a few). I would definitely try to explain this differently if I decide to use it again. This was a special evening edition of Shake, Shimmy that I did twice during the summer. I used popular, mainstream music instead of children’s music in the hopes of reaching adults and families in a different way. This book is another that has personal meaning to me — “Three Little Birds” the song is what I sing to myself when I’m having trouble or worries. It’s something that started shortly after I discovered the Elizabeth Mitchell version of the song. It really resonated with me and I have it saved on my work computer for this express purpose. I really wanted to show families the power of song using this exact one. Songs can improve our mood and help us through harder times. Since this was a VERY different kind of Shake, Shimmy program, I started with some announcements. I explained that children’s music songs are typically a lot shorter than regular contemporary songs, so if our group started to lose energy I planned to do a slow fade-out. Our first song, Can’t Stop This Feeling was another familiar song for the majority of attendees and worked in the same way as Happy did in the 6/30 program to get immediate staff buy-in. And for this library, Trolls is a huge draw. This song was a free dance. Next, we danced to Shout Part 1 and did the typical motions that you might see on a dance floor at a special occasion. Since we used these familiar motions, caregivers were all in for this one and I probably could have played Part 2 as well! Shut Up & Dance was the one song that I waffled about for a while. Was “shut up” an appropriate phrase for kiddos to hear? Ultimately, since the playlists were available at the Kids & Teens desk prior to the event, I decided that caregivers could make that decision for themselves. I also advanced the slide before announced the title of the song, letting them decide if a bathroom break was in order. (No one left.) It was another free dance, this time with a grown-up that you care very much about! And our last non-prop song was Sweet Caroline. I’ll be honest, four mainstream songs that range in three to four minutes of length prior to props is too much and I would change that in the future. I felt poor Sweet Caroline got cheated and I wound up doing a slow fade on it to move on to prop songs. Scarves were used in both Let It Go and Firework. To differentiate the movements between songs, I had the kids pretend their scarves were Elsa’s sleeves. It worked! I’m not sure when GOES POP! will be back on our schedule, but I still think it was a very valuable experience! This book holds a special place in my heart. It was a baby shower gift for my sorority sister a few years back. I just adore Hopgood’s bright illustrations to accompany this beautiful song. Now, this was a departure from the kind of books that I normally promote at the front of this program. I generally try to pick books that warm up the crowd, but this time I wanted to highlight our Picture/Play/Songs area of the collection and to show caregivers that we have a wide variety of titles there, including popular music. Our first song, Happy, was one that most of the participants (kids included) were familiar with. In fact, I planned it that way! I wanted a bridge for both age groups to get on board with the program. We danced our best “happy” dances during this song and it should be no surprise that a lot of clapping took place. Another free dance song was Dance, Dance, Dance immediately after. I purposely followed a newer song with a classic song. Next up, we “swam” around to Riptide. This song was a surprise hit with caregivers my age (33), but I could tell that I lost some of the older caregivers who might not recognize this more contemporary artist. But they still knew how to swim around! I Wanna Dance With Somebody encouraged caregivers to dance with their kids. I saw some great partner dancing with kiddos spinning in their grown-up’s arms, holding hands, and really having a lovely bonding experience. Finally, it was time to break out our parachute. I used the smaller version since our crowd was lighter than usual. We practiced moving the parachute slowly during I Will Wait until the chorus kicked in; we had done enough waiting and it was time to shake it as fast as we could. And Here Comes the Sun allowed the parachute to rise and fall like the sun. I also had a great opportunity to go along with the kids’ suggested play when one of them said the sun was hot and playfully yelled “OUCH!” A small chorus of ouches followed. So…was the different version of this program worth it? I think that it really was. Caregiver engagement was up, and while I had some morning families at the nighttime version, every single one of them brought a family member that I had not met before. This was another Caldecott eligible book, so I won’t be talking about it on the blog. Like a Spinning Top is a song tailor-made for gross motor practice. The kids and I wound up spinning, jumping, wiggling, and flying with such glee — it’s a great way to start off a program. Afterwards, we did some more jumping with Jim Gill’s Jumping and Counting. The kids never get tired of jumping and I love that this song also incorporates a math activity with some counting practice! Our last song before I brought out the prop activity for the day was Blast Off. There are a lot of countdown/rocketship songs in children’s music and for good reason — the kids never get tired of them! I also like to pass on the caregiver tip that this is a great opportunity to lift smaller friends up in the air for maximum blast off potential. Then it was time for the scarves to come out! For Popcorn, we bunched up the scarves and popped them into the air. And for Butterfly, the caregivers helped the kids pinch the middle of their scarves to turn it into a butterfly. Talk about some great fine motor skill practice! This program really does it all. The book I used is Caldecott eligible, so I won’t be commenting on it. I started today with a song with great energy — Wake Up, Shake Up — to get the kids and caregivers up and moving. My instructions to the group was to stretch and free dance during our opener. Afterwards, I launched into Let’s Get Together which I really like using for imaginative play. The songs asks friends to pretend that they’re different animals and my friends never disappoint me with their creative movements. I rounded out with a new rendition of a classic song, Head Shoulders. This song is a great way to draw in caregivers since it’s something that they recognize. It’s also fun for kiddos because it challenges them to practice body identification in a fun and engaging way. Then, it was time for our giant parachute! We did two songs with this prop (both Shake, Shimmy classics). The first was The Shimmie Shake which lets the kids get all their energy out by shaking the parachute as fast as they can. Towards the end of the song, the group does tend to get tired, but our next activity always gets their re-energized quickly. During Under a Shady Tree, I let the kids run underneath the parachute while caregivers raise and lower the chute over them. This is everyone’s favorite parachute activity and I make sure to always include a part of the program where they can explore underneath. Today, I wound up having to join them underneath when I had a few friends who wanted to hold the parachute down.